Before there was PTSD there was shell shock and combat fatigue and Gene Kelly’s Combat Fatigue Irritability. 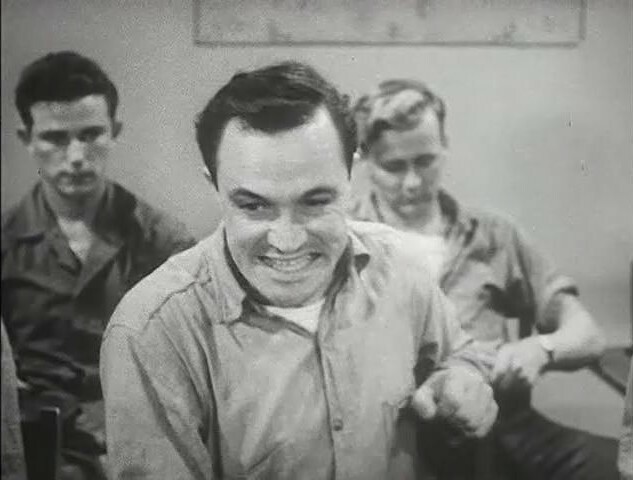 Combat Fatigue Irritability was made during World War II as a “naval training film” (although, unlike most military training films, there is very little training going on in this film). First screened in 1945, it was probably only shown to two select groups: men who were being treated in military facilities for what was then called “combat fatigue” (a category that eventually gave rise to our term, “post-traumatic stress disorder“); and to health professionals who treated such men. It was a “restricted” film, only for military viewing. After the war it was forgotten. It has never received any attention from film historians, and very little from fans (a few of whom did know of it but never got to see it). It is missing from the Gene Kelly filmographies in reference books and not listed on IMDB, Wikipedia and other websites. Missing, but never really lost. For the last six decades or so, a copy has been filed away, along with thousands of other films, at the National Library of Medicine. The only people it has been lost to are the public and Gene Kelly’s devoted and still numerous fans. Readers here may want to know a bit of historical context: on the role of film, and particularly training films, in the American war effort; on medicalization and the role of psychiatry in the war effort; and also on the making of Combat Fatigue Irritability. First the war: America entered World War II in December 1941, after the bombing of Pearl Harbor. From early on, the conflict was seen as a total war and a modern war, requiring modern methods in every respect. Thus “all hands on deck” included the deployment of university-educated professionals and the application of professional expertise and technology at every level in shaping policy and carrying it out. In this way, psychiatry was recruited for war. Psychiatrists were given the status of officers and consulted on civilian and troop morale, preparation of troops for combat, and the treatment of psychological wounds incurred in battle. Psychology was mobilized, the military ethos psychologized. In previous wars, fear was typically stigmatized as cowardice, an unforgivable moral failing. Troops who suffered from “shell shock” might be pitied and even receive palliative care, but treatment occurred largely within a moral framework, not within a psychological theory or medical system. World War II was different. Fear was reconceptualized as an adaptive response, “combat fatigue” as a psychological condition requiring psychotherapy administered by psychiatrists. Freudian psychoanalysis was the dominant paradigm: treatment had to take into account not only the triggering experience, but also the patient’s psychological history, from childhood on. Buried conflicts, repressed emotions, and traumatic episodes had to be brought to the surface, relived, confronted, and in that way resolved. Sedatives, occupational therapy, and exercise played a supporting role. Psychiatry, of course, wasn’t the only profession inducted into the war effort. Film was an emblematically modern technology, and thought to be almost magically effective in educating and motivating viewers. The U.S. military reached out to Hollywood to produce movies that entertained and distracted the troops, bolstered morale, promoted health, improved efficiency, and complemented classroom and field instruction. 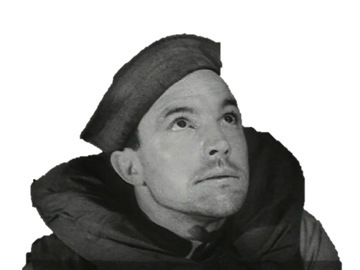 The U.S. military also drafted Hollywood talent, directors, animators, technicians and actors, including up-and-coming stars like Gene Kelly. Despite its unappealing title, Combat Fatigue Irritability is one of the best military productions of the war. It features a good script, score, editing, direction, and superb acting by an uncredited cast. 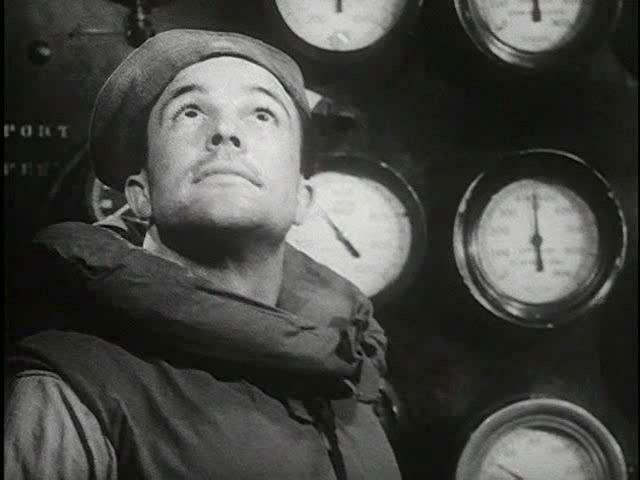 Gene Kelly directs and plays the lead role of Seaman Bob Lucas, a troubled and angry “fireman” whose ship was sunk in battle. Many sailors died at sea, and Lucas came close to death himself. But he came through it and suffers from what now might be termed “survivor’s guilt” or “post-traumatic stress disorder.” After repeatedly lashing out at everyone around him, Seaman Lucas comes to understand and control his emotions, and moves from illness to wellness, with the help of a wise (and, typical for the era, chain-smoking) psychiatrist officer. To prepare for the role, Kelly had himself admitted to a naval hospital, posing as a sailor suffering from combat fatigue. According to biographer Alvin Yudkoff [Gene Kelly: A Life of Dance and Dreams (New York: Backstage Books, 1999)], during his hospital stay Kelly “absorbed the routine: the physical therapy, the drab meals, the bull sessions with the guys, the docs playing with his head . . . and mostly, the hours in bed, staring at the ceiling . 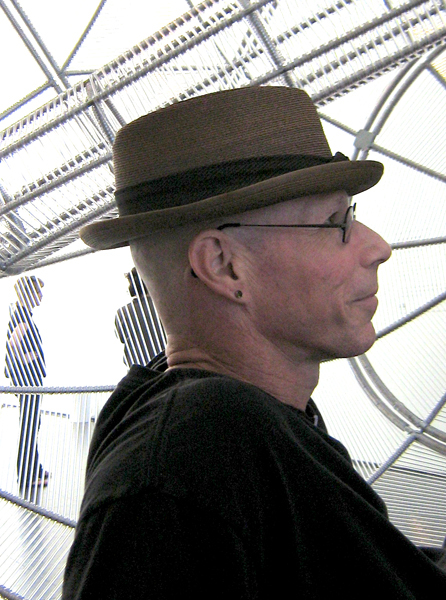 . . .” Unsurprisingly, given Kelly’s celebrity, someone snapped a picture of him, which found its way into the papers along with a story that mistakenly reported that Kelly had been in combat overseas and was now hospitalized for “battle fatigue.” (In fact Kelly spent his war years stateside, making movies for the Navy.) Yudkoff reports that Kelly considered his performance in Combat Fatigue Irritability one of the best he’d ever given. Combat Fatigue Irritability will be screened at the New York Academy of Medicine (1216 Fifth Avenue at 103rd St., New York, NY) on Saturday October 5, 2013, at 1:00 P.M. The screening is part of an all-day Festival of Medical History and the Arts and is free and open to the public. A second screening, also free and open to the public, will take place as part of the History of Medicine Lecture Series at the National Library of Medicine (Lister Hill Auditorium, Bldg. 38A, 8600 Rockville Pike, Bethesda, MD), on November 19, 2013, beginning at 2:00 P.M.
Medical Movies on the Web highlights selected films in the National Library of Medicine’s digital collections along with expert commentary and supplementary material that sets the films in historical context. Next Post: Sorry, we’re out of the office. Thanks for your well-informed article. I do want to point out, though, that to say that this was Kelly’s first dramatic role is an incorrect statement. 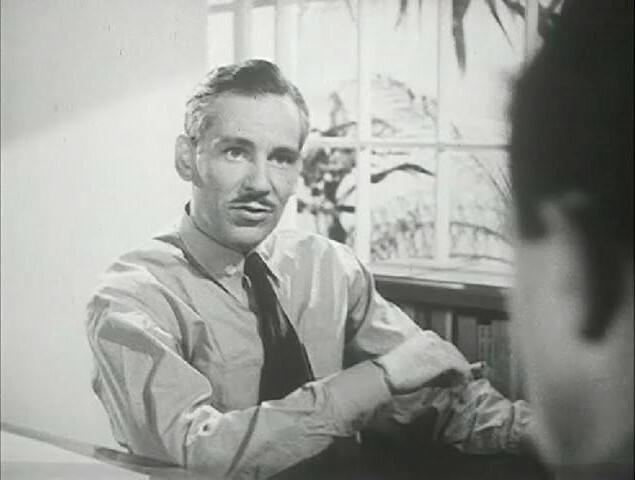 In 1944, he starred in Robert Siodmak’s very dark film noir CHRISTMAS HOLIDAY, in which he played a murderer with a mother fixation. Although it was an excellent film, it was not a huge success, and Kelly soon returned to the lighter musical roles he was best known for. Interesting article, and an interesting comment by Mr. Myers. Thanks to both of you, Mr. Sappol and Mr. Myers. Thanks to all. One more shout out to all of those who are now viewing Combat Fatigue Irritability: can any of you identify any of the other cast members (none of whom are credited)? I’m especially interested in identifying the actor who plays the wise psychiatric officer, who also appears in other military psychiatric films of the period. Shortly after this post appeared (in tandem with the posting of the film, with commentary, on the NLM’s Medical Movies on the Web (http://www.nlm.nih.gov/hmd/collections/films/medicalmoviesontheweb/), a short entry on Combat Fatigue Irritability popped up on IMDB. It gives some of the credit information that we lacked. The wise psychiatric officer was played by Lauren Gilbert, a Hollywood actor who later appeared in supporting roles in major films and television shows into the mid-1970s. Seaman Bob Lucas’s girlfriend was played by Jocelyn Brando, Marlon’s older sister. She had a long and eventful career on Broadway and in Hollywood, both in motion pictures and television. Seaman Lucas’s friend, the First Mate, was played by Harlan Warde, who later went on to act in supporting roles in “B” movies and television. Since a young Italian girl, the impact of the aftermath of WWI and WWII, into music and cinema took my attention. It goes without saying, that also justifies why I am running this website in english, British and American cultures still have a huge influence on the Italian mood. Something that was so evident, for example, was the massive musicals after WWII. Gene Kelly, Debbie Reynolds and Fred Astaire were the leading Hollywood stars of a joyful, but yet moving and educational movie making.